Having made the decision to pursue a career as a sonography tech, the next step is to select a program for the education and training you will need. If looking for a program in the region of the Great Lakes, there are excellent sonography tech schools in Michigan. To make the final selection as to which is the best school, there are criteria to consider. Accreditation is an assurance that the program or school meets the nationally recognized standards of quality and attending an accredited program is a prerequisite for future registration as a sonographers. When looking at the accreditation of sonography tech programs in Michigan, it is essential to know that there are two types of accreditation. There is accreditation of the program, or programmatic accreditation, and there is accreditation of the school, referred to as institutional accreditation. The Commission on Accreditation of Allied Health Education Programs (CAAHEP) is a programmatic accrediting agency for educational programs in 23 health science professions, one of which is the program for sonography tech, also referred to as the diagnostic medical sonography (DMS) program. Attending an accredited program will ensure adequate preparation for entering the diagnostic sonographer profession. 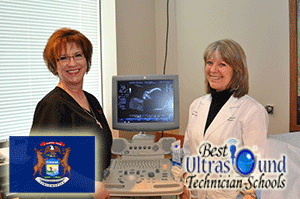 There are over ten ultrasound tech schools in michigan accredited by the CAAHEP. Another factor to consider when researching sonography tech programs michigan is specialization. While there is a general sonography degree, there are also areas of specialization in the field of sonography such as obstetrical, gynecologic, vascular, and cardiac ultrasonography. If the desire to specialize is present at the outset, look for a program that offers that concentration. If the desire is to begin in the general sonography studies, yet maintain openness to specialization, consider a university that offers the opportunity to transfer from the general program to a specialized ultrasonography program. Ultrasound technician programs offer a selection of degrees from a certificate to a baccalaureate, depending upon the length of the program. Program length varies from one year for a program certificate, two years for an associate degree, and four years for the baccalaureate degree. All of these programs will provide the required education for becoming a registered ultrasound technician, however, due to the rapid advancement in ultrasound practice, serious consideration must be given to attending a university that offers the baccalaureate degree in diagnostic ultrasonography. Possessing the baccalaureate degree will command a larger salary and offer future career opportunities in leadership and management. However, if time and finances preclude commitment to four years of education, consider attending an accredited certification program with plans to continue future education as time and finances allow. Working as a valued member of a health care team and providing the skills to competently operate high-tech ultrasonography equipment to assist physicians in making the correct medical diagnosis makes a career as an ultrasound technician a rewarding one. Commitment to continual learning to stay abreast of this rapidly growing health care profession and to maintain expertise in the operation of modern ultrasonography machines begins with thorough research into the ultrasound technician programs in Michigan.